Landscapes of Childhood began as University of Michigan course and grew into an artistic project bridging folks at C.S. Mott Children's Hospital with the great outdoors at Nichols Arboretum. I had the fortunate position to both participate as a student and collaborate with Anja Bieri and Elizabeth Goodenough to nurture this concept to a permanent installation. Close readings of children’s literature by authors from the Great Lakes region provided the foundation for exploring the question of how tales of home and play shape our understanding of nature, society and our personal landscapes. We chose Nichols Arboretum as our playground for its ambiguous character of being both sustained Michigan nature and cultural or cultured landscape. During Fall semester we took field-trips together, but students also went on individual research walks to record sound and voice for their soundscapes. While the “Arb” provided our connection to notions of nature and a wonderful opportunity to be outside so close to campus, some students also played with the transition to commercial settings and the differences between the urban and the park’s acoustic contexts. 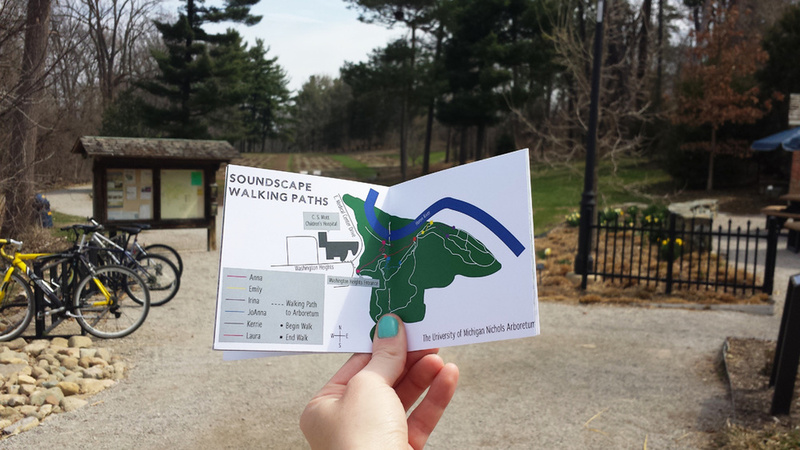 All soundwalks live on our website that unites productions and gives a larger public the opportunity to download their soundwalks and to listen to them while walking through the areas in Nichols Arboretum that inspired the students. I designed and distributed booklets explaining the project and providing links to the website around Mott Children's Hospital to invite children, staff and families to explore the outdoors together while listening to enchanting storytelling that ignites the inner child in us all.